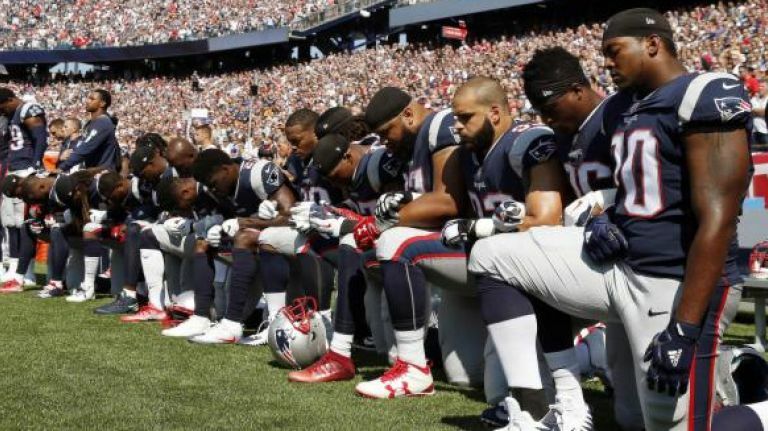 With the NFL’s preseason underway, players taking a knee in protest of racial injustice is once again part of the national conversation, in no small part due to our president’s obsession with forever calling attention to it, and then demanding that we pay no attention to it. Perhaps instead of criticizing the players for protesting racial injustice in America, or denying that it exists, Republicans would do well to join them in their protests, and point out that what they are protesting is almost exclusively the result not of historical grievances, but problems created in our own time by terrible liberal policies. And there is plenty of injustice to protest. It is an injustice that millions of poor black children living in cities run by Democrats are trapped in failing public schools. It is an injustice that these schools get more money the more they fail, when we could send these to private schools and high-accountability public charters schools for less money, where they’d actually get an education and have a chance of succeeding. It is an injustice that the Democrats have sold these children out to the teacher’s unions who oppose school choice. It is an injustice that those poor black children in these same Democrat cities can’t play in a park, or walk to school, without fear of being accosted by gang members who should be in jail, but for liberal judges, liberal policymakers, and a liberal criminal justice system that is so overloaded that is has become a tag and release program. It is an injustice that drugs flow freely across the United States’ open borders and into our cities, fueling a gang culture that has destroyed every community it has touched. Our cities used to be relatively calm and peaceful, but drugs turned them into a war zone, with murder rates that rival that of the Central and South American cities terrorized by drug cartels. That’s an injustice. It is an injustice that for decades the manufacturing jobs that African-Americans filled went overseas, while our politicians shrugged their shoulders and declared that to be the new normal. It is an injustice that they sold out American workers to globalist elites. It is an injustice that African-Americans, who have been here in large numbers longer than nearly any other group, keep getting pushed to the back of the line, as we import hundreds of thousands of needy people into this country annually, straining the social services that are supposed to help America’s most vulnerable. It is an injustice that the government so badly interferes with the student loan industry that a college education costs nearly as much as a mortgage, making a good four-year education virtually inaccessible to the nation’s poorest. It is an injustice that the welfare system that is supposed to help the poor instead punishes the poor by threatening to take benefits away to the extent the recipients try to advance themselves. And it is absolutely an injustice that the same welfare system has destroyed the black family by kicking black fathers out of their households. When the liberal Democrat Senator Daniel Patrick Moynihan issued his report on the Africa-American family in 1965, he was alarmed to find that one out of every four black children were born to single mothers. Today, that number is three out of four. And that’s not because of slavery or Jim Crow, but rather because Democrats created a welfare system that conditioned the receipt of benefits on black fathers leaving their wives and children. Lyndon Johnson’s administration in the 1960s actually sent federal workers into black communities to go door to door, telling black women that they would qualify for welfare benefits if they left their husbands. Go watch the 1974 movie Claudine, where a single black mother tries to hide her boyfriend from a social worker so she can keep collecting welfare, and know that nothing has changed! Today, if that same woman finds a man with a good job that she’d like to marry, the government punishes her by threatening to take away her benefits. So the kids stay fatherless, and the crisis that causes more inequality than anything else continues. We talk a lot about entitlements in this country. We should all agree that every child is entitled to be raised by his parents, and not have his family deliberately destroyed by a malevolent government that seeks to keep them in a perpetual state of government dependence. That’s an injustice that we should all protest. Sorry, but if what is happening to African-Americans is the result of racism, then the liberal policies that are causing the problems are racist, and the liberals who advance them need to be held accountable. So, conservatives, instead of complaining when NFL players take a knee, we should express our empathy. And our message needs to be a contrast. The Left tells everybody who they screw over that they are victims. We need to say no, you are victors. You are overcomers. You overcame slavery, you overcame Jim Crow, and we are here to help you overcome all the terrible things liberalism and the Democratic Party have done to you. And just as the Republican Party freed African-Americans from the slavery of the plantations, so it will be this Republican Party that frees African-Americans from the slavery of poverty, the slavery of bad schools, the slavery of dangerous streets, the slavery of broken families, the slavery lack, and want, and need that always accompanies liberal, socialist policies, and that denies you your right to the American dream, so help us God. Maybe instead of forever criticizing these players, it would be better to acknowledge racial injustices in this country and point out that they are caused by bad liberal policies.